Cellulitis is a common bacterial infection of the deeper layers of the skin, specifically the dermis and subcutaneous tissue. In addition to skin redness, swelling, and warmth, which often spread quickly, a person may also experience fever and/or chills, especially if the infection is severe. Any break in the skin can leave you vulnerable to this infection. And while often effectively treated with antibiotics, certain cases can be life-threatening. Cellulitis causes your skin to be red, swollen, tender, and warm to the touch. In addition, sometimes the texture of the infected skin will be described as "cobblestone" in appearance. Red streaks radiating from the area and swollen lymph nodes are also common features of cellulitis. Fever, chills, and/or fatigue may be present as well, especially if the infection is severe. In children, cellulitis typically appears on the face and neck, while adults will most often get cellulitis on the arms or legs. Cellulitis is almost always caused by a bacterial infection. Bacteria are able to enter the body through breaks in the skin, such as from a cut, scrape, ulcer, spider bite, tattoo, or surgical wound. Skin conditions, like eczema, athlete's foot, or very dry skin, can also lead to skin cracks that provide an opening for bacteria. In adults and children, cellulitis is most often caused by Streptococcus and Staphylococcus aureus bacteria. Another type of bacteria, Haemophilus influenzae type B, can cause cellulitis in children younger than 3 years of age, but this has become less common since vaccinations against this bacteria have become routine. Animal bites, such as a from a dog or cat, may lead to an infection with Pasteurella multocida. Dog bites may rarely cause an infection with Capnocytophaga, which can be fatal in those with alcoholism, without spleens, or who have underlying liver disease. Exposing a wound to warm, salt water may lead to cellulitis from Vibrio vulnificus. While the cellulitis is generally mild, in high-risk individuals—those with liver or alcohol problems, or a chronic illness like diabetes—the infection may spread rapidly and become life-threatening. Keep in mind that cellulitis can also develop in skin that appears perfectly normal. For example, repeated infections may develop in areas where there has been damage to blood or lymph vessels. Cellulitis is usually diagnosed based on its appearance. 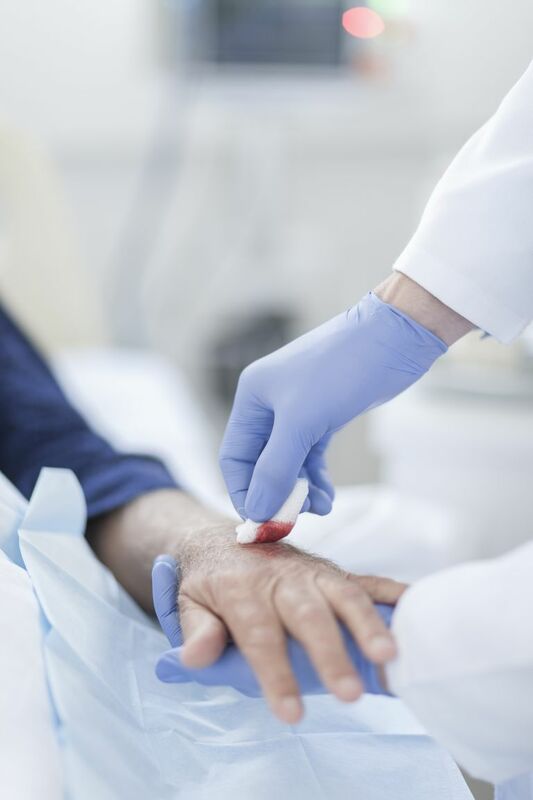 Sometimes doctors will check a person’s blood count to see if the white blood cells are elevated (meaning that the immune system is fighting an infection). That said, an elevated white blood cell count may not occur in the early stages of an infection. In people who are very ill, blood cultures may be performed to see if the bacteria has spread into the bloodstream. Unfortunately, cultures are only positive in less than 10 percent of cases, making a definitive diagnosis difficult. Less commonly, a doctor may opt to perform an aspiration, which involves the injection of sterile fluid into the infected tissue, after which fluids are drawn out in the hopes of capturing some of the bacteria. This is usually done only in extreme cases since aspirations may return inconclusive results. Also less commonly, a skin biopsy culture—where a small sample of the affected skin is removed and placed in a Petri dish to see if bacteria grow—may be performed if the diagnosis is uncertain and/or to rule out diagnoses that can mimic cellulitis, like or a drug reaction or vasculitis. Finally, imaging tests, such as an ultrasound or magnetic resonance imaging (MRI), may be used to distinguish cellulitis from another diagnosis, like a deep venous thrombosis (DVT) or osteomyelitis (a bone infection). Cellulitis is treated with antibiotics, which are medications that target bacteria. Most cellulitis infections require a 10-day course of an oral antibiotic, although the precise duration will ultimately depend on the severity of the infection. Most people will note symptom improvement within 24 to 48 hours of starting their antibiotic. Is the redness shrinking? The infection is likely improving. Is the redness expanding passed the marked line? The infection is likely worsening. Besides taking an antibiotic as prescribed by your doctor, if the infection is on an arm or leg, elevating the extremity can speed healing. Rest is also important for the healing process. Additionally, your doctor may recommend a special dressing to keep the infected skin covered. In addition, infections that don't improve or get worse with oral antibiotics require immediate medical attention. Serious complications may arise from untreated cellulitis including sepsis (when the bacteria enters your bloodstream), necrotizing fasciitis (when the infection reaches deeper tissues), and abscess formation. It's also important to address with your doctor any underlying health condition that is increasing your risk for developing cellulitis, such as poorly controlled diabetes, obesity, or extremely dry skin. Never hesitate to see a doctor if a wound you are nursing suddenly gets redder, becomes painful, or starts draining. This is especially true if you have diabetes, are experiencing poor circulation, or are taking immune-suppressing drugs. Waiting is rarely a good idea. A persistent rash or skin that is deep red and inflamed may signal a more serious infection of the dermis (the inner layer of skin). As with all skin disorders, earlier detection allows for more effective treatment. Gunderson CG, Martinello RA. A systematic review of bacteremias in cellulitis and erysipelas. J Infect. 2012 Feb;64(2):148055. doi: 10.1016/j.jinf.2011.11.004. Habif, T. "Bacterial Infections." Clinical Dermatology, 4th Edition. New York: Mosby, 2004: 236-62. Halpern, A., and Heymann. W. "Bacterial Diseases." Dermatology. 2nd Edition. New York: Mosby, 2008: 1075-84. Morris JG. Vibrio vulnificus infections. Calderwood SB, ed. UpToDate. Waltham, MA: UpToDate Inc.